The post-apocalyptic zombie horror-thriller The Girl with All the Gifts features Glenn Close (TV’s Damages), Gemma Arterton (Byzantium) and Paddy Considine (Now is Good) in its impressive cast. Sennia Nanua is The Girl with All the Gifts. Humanity has been all but destroyed by a fungal disease that eradicates free will and turns its victims into flesh eating “hungries.” Only a small group of children seems immune to its effects. At an army base in rural England, these unique children are being studied and subjected to cruel experiments. When the base falls, one little girl (Sennia Nanua) escapes and must discover what she is, ultimately deciding both her own future and that of the human race. Upon its limited Stateside theatrical release in February, 2017, the Colm McCarthy-directed flick garnered a quite-good 85% Fresh rating at reviews aggregator Rotten Tomatoes based on 91 published write-ups. 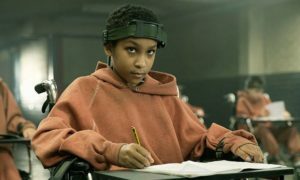 The disc and digital editions of the R-rated film include the “Unwrap the Secret World of The Girl with All the Gifts” featurette.